Eventually Elena looked for a social outlet online, where she hoped she wouldn’t be judged, and began chatting with a Canadian woman named Meg. She soon found herself falling for her online friend. “Meg can do everything, she is a musician, she plays the piano, flies planes, sails boats…To me she was this incredible woman, she simply stunned me with what she could do, and, of course, I pretty much instantly fell in love with her,” Elena recalled. 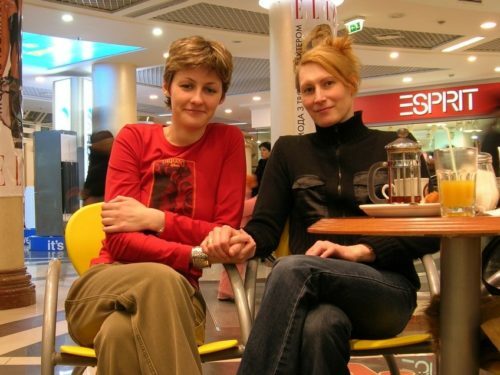 Elena and Meg in Kiev in 2006. Elena ran off to be with Meg, finding happiness at last, but it was short lived, as she soon began to get phone calls from her family and her ex-boyfriend. “My mother was telling me to go back to Ivanovo and I was saying that I wouldn’t because then I would never see Meg again,” Elena said. Her mother said she would let her live her life, but not before having checked on her one last time in Kiev. Elena said she refused to return to Ivanovo with her parents, the first time she had ever dared disagree with them, and it lead to a fight. Police intervened and surprisingly, they sided with Elena. Her parents went back to Russia, but first her mother had managed to swipe her passport. Elena eventually got it back through a friend back in Ivanovo. It was then that the couple decided it would be best for them to seek a safer place to call home, and began hatching a scheme to get to Canada, where they could seek asylum. The couple headed to Turkey, and Meg mortgaged her home and in Canada and bought a boat. After two months, they set sail for Canada. 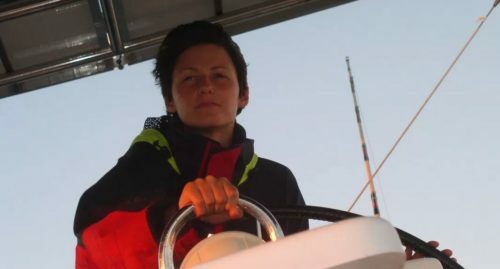 They had to endure 10 months straight of sailing, including surviving a hurricane in the Atlantic, before finally reaching the safety of Canadian soil. “When we arrived, it was all very quiet, it was 2 a.m., we simply parked the boat at the yacht club and there was nobody there. And that was the irony of it. We had completed such a huge journey for love but there was nobody to meet us. It was pretty silent. We didn’t actually need anything, we just wanted to sleep, to rest, and to start living our life,” Elena said. The couple still live on the boat they arrived in Canada on a decade ago, and Elena has written a book about their adventures together, called Talking to the Moon. Their story is even more notable in light of the recent reports of abuse against gay and bisexual men in Chechnya. Russia has concluded an investigation into the situation, claiming no wrongdoing despite the evidence to the contrary. The Russia LGBT Network is working to get men free from the region, but the U.S. State Department is reportedly refusing to grant visas to them, even though they are fleeing in fear of their lives. Yesterday was International Day Against Homophobia, Transphobia and Biphobia, and cases like these are why such a day is still so necessary, and why it is important to remind the world that love is love.